U.S. Federal government agency set-up to promote media freedom abroad tried to misappropriate domain names to stifle journalistic scrutiny by American reporters and limit exposure of its failures. PORTLAND, OR, September 26, 2018 /24-7PressRelease/ — An independent watch dog website, BBG Watch (bbgwatch.com), run by journalists who volunteer their time, thwarted a recent attempt by the U.S. Agency for Global Media (USAGM) to misappropriate domain names in order to prevent their use by investigative reporters in the United States. BBG Watch has reported on this and other efforts by USAGM officials to limit scrutiny by U.S.-based reporters of the government agency’s overseas and domestic activities and to interfere with free press in America using the power and resources of the Federal government in apparent violations of the First Amendment, the Smith-Mundt Act, and journalistic ethics. The latest government interference with U.S. media occurred while the agency was preparing earlier this year to change its name from the Broadcasting Board of Governors (BBG) to USAGM. On May 11, 2018, USAGM registered domain names (USAGMWatch.com and USAGMWatch.org) in an obvious attempt to prevent BBG Watch from acquiring and using these domains prior to and following the agency’s official re-branding on August 22, 2018. BBG Watch independently confirmed that a USAGM employee reserved .com and .org “Watch” domains, listing USAGM’s official Washington address. BBG Watch complained to the Federal agency’s management and presidentially-appointed and Senate-confirmed Board. Only after a delay of several days and a second email, did the USAGM (on September 21st) contact BBG Watch to state that “a process for removing current ownership of the two domain names referenced in your emails has been fully initiated.” The agency said the process of de-registering the domain names might take approximately 30 days to complete. However, Federal government agencies use .gov for their domain names. USAGMWatch.com and USAGMWatch.org have no apparent application to the USAGM congressionally-mandated overseas mission. As of the date of this press release, USAGM has failed to respond to additional specific questions from BBG Watch as to who ordered and approved these registrations. The agency’s registration of USAGMWatch.com and USAGMWatch.org appears to have been aimed at making domestic criticism of agency’s operations more difficult to find online. It constitutes a dangerous attempt by a Federal agency to interfere with American media and is a serious violation of the First Amendment protection of free press in the United States. Such underhanded actions by USAGM Federal government officials and employees are a threat to journalists and media freedom, BBG Watch founder and supporter Ted Lipien, former Voice of America (VOA) acting associate director, said in response to these revelations. Combined with confirmed instances of pro-Iran regime propaganda in VOA and Radio Farda programs, these actions point to a failure of senior leadership at USAGM, Lipien said. However, as BBG Watch noted in an e-mail to USAGM CEO John Lansing and other agency officials, it was highly inappropriate for a taxpayer-funded government entity that promotes media freedom abroad, to hold “closed meetings” in an otherwise public venue in the Nation’s capital and to attempt to limit media coverage. BBG Watch is, as of this writing, one of the few independent websites serving a watch dog function for a Federal agency. With many sources in USAGM, our volunteers have reported on mismanagement and diminished effectiveness of the Broadcasting Board of Governors, which is now officially called the United States Agency for Global Media. Recent reporting and commentary has highlighted potential conflicts of interest of some past and present BBG Board members and agency officials with corporate business interests in China and Russia, mistreatment of employees and contractors, pro-Iranian regime propaganda in Voice of America Persian broadcasts, actions taken against five Chinese journalists at VOA, and protests by award-winning women journalists and former Vaclav Havel Fellows against mismanagement at Radio Free Europe / Radio Liberty (RFE/RL), which is one of USAGM’s media entities. 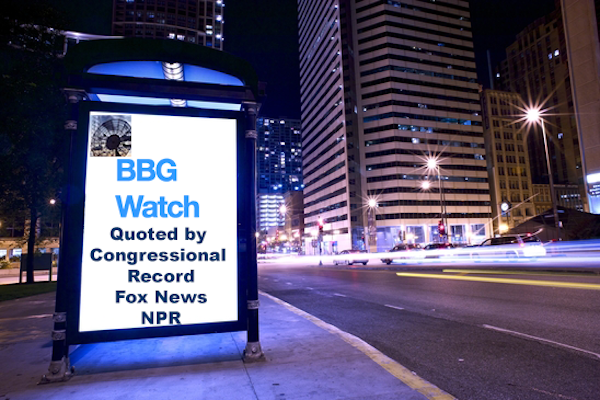 BBG Watch has been cited by The New York Times, The Washington Times, The Washington Post, The Washington Examiner, CNN, Fox News, NBC News, NPR and other media outlets in the United States, as well as by The Congressional Record. For more information on this matter, and the work of BBG Watch, media are encouraged to visit bbgwatch.com or contact Ted Lipien, Free Media Online President, at: [email protected], tel. 415-793-1642.